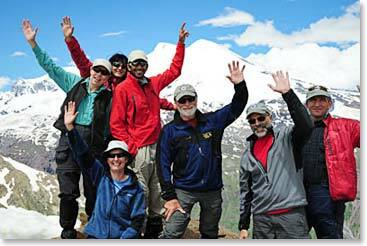 The Berg Adventures Crew would like to say a heartfelt congratulations to this season’s Elbrus Climbing Team. Congrats to Bill, Tom, Linda, Paule, and Mo as they braved the cold and ice on their way to the top of Europe’s highest peak, Mount Elbrus at 18,586ft/5,665m. Follow their Russian adventure through the daily dispatches.